Unser Interesse gilt der Flugsimulation am PC und insbesondere der Software „IL-2 Sturmovik“ und seinen Nachfolgern. der Luftfahrt, sodass der Bezug zur realen Fliegerei gewahrt und miteinbezogen wird. Falls du Fragen, Kritik oder Lob äußern möchtest, stehen unser Forum und das Gästebuch bereit. Nun viel Spass auf unserem virtuellen Fliegerhorst. Welcome to the homebase of the virtual I. Gruppe Jagdgeschwader 27. We would like to give you a short introduction on who we are and what we do within the subsequent lines. 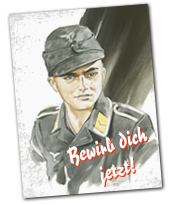 In February 2003 we arose from the virtual I/JG26. Ever since we tried our best to make our name in the rather small community of flight simulations.Our squadron is named after the historical Luftwaffe squadron I. Gruppe Jagdgeschwader 27, and therefore we are focused on German planes and tactics. Lead by the ideas and principles, of which we think they are essential for both a successful team-play and strong company within our members, we challenged the long way of virtual flying as a squadron. Our focus is set on the virtual live and we essentially see our activities somehow as a role play in which we can advance our virtual career. Apparently we designed our virtual homebase to meet this requirements and therefore offer self programmed, fully automatic website with a (wip-)coop-mis report system as well as detailed self-created graphics (ranks, awards and so on) and interesting photo and screenshot albums of your events. Unfortunately many people, essentially those who do no not make an effort to gather further information about what we do, think that virtual pilots flying for the German side in IL-2 would like to see a resurgence of the Nazi aera. That is definitely not the case. We aver not to approve the crimes or ideologies that have been present during world war 2, nor we accept such behaviour by any of our members. We clearly separate reality from our virtual activities. Teamwork and the challenge against international players is what still attracts us to the game after all those years, not the possibility to continue a war that has caused so much pain to Europe. We think that the long list of people we call friends, is the best evidence against all those inconsiderate preconceptions. Although many of our members are able to speak and understand English without difficulties, we decided to acertain German as the main squadron language. So we unfortunately have to reject applications from non-German speaking pilots. Nevertheless we are open for international cooperation regarding flight affairs. (In case you would like to arrange training flights or flight events we ask you to contact the squadron commander via mail or the Forums. After almost 10 years of activity we are still addicted to the virtual operations we use to participate multiple times a week. As the sequel of IL-2 Sturmovik is announced , we are preparing to join a new aera of flight simulations. In order to strengthen our group for the upcoming battles of the British-Channel, we are always open for applications of enthusiastic recruits. Am 14.03.2018 wurden Battle of Kuban offiziell veröffentlicht. Bereits heute fanden sich 5 Piloten des Geschwaders zusammen um sich im Luftkampf den russischen Assen in La-5, P-39 und Co. zu stellen. Auch wenn einige Verluste zu verbuchen waren, konnten I/JG27_Pauke, I/JG27_Nemesis, I/JG27_Rollo, I/JG27_Steini und I/JG27_Zimmi zeigen, dass sie das Fliegen nicht verlernt hatten. Horrido! Der nächste Geschwaderabend findet Samstag gegen 1930 statt.